The Readership of Intelligent Trading Technology Recognizes NovaSparks for Offering the Best High Performance Hardware Data Feed Handler. 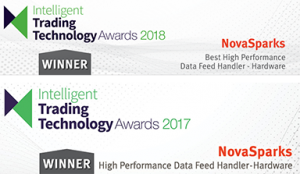 NEW YORK, LONDON, PARIS- JUNE 7, 2017 – NovaSparks™, the leading field programmable gate array (FPGA) market data company, today announced that the Readership of Intelligent Trading Technology selected NovaTick as best high-performance hardware data feed handler at the Intelligent Trading Technology Awards 2017 Ceremony. The awards presented during this ceremony acknowledged excellence in trading technologies within capital markets, focusing on specialized suppliers of trading operation technologies. NovaTick’s design is based on a pure FPGA architecture where all real-time market data processing functions are performed in hardware resulting in the lowest and most deterministic latency. This FPGA-centric architecture is augmented with tightly integrated Intel processors to support non-latency sensitive tasks such as exchange recovery functions.